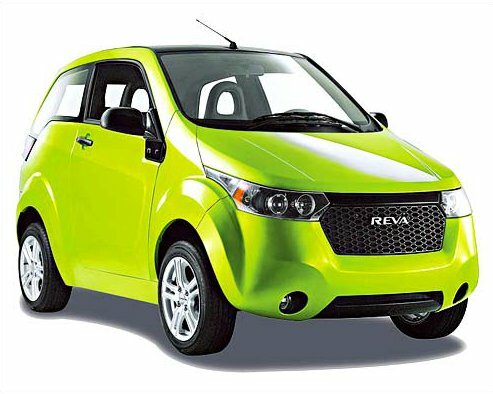 Finahub Official Blog: To Buy or Not to Buy A Mahindra Reva. There was a big discussion amongst ourselves about petrol prices and the cost of using a car on a daily basis. The way things are going it seems petrol prices are only going to increase in the long run and we need to come up with a viable alternative to petrol. This obviously led to Mahindra Reva, the only electric car available in India. There were opinions for and against Reva, for many the Reva was too costly when compared to a Maruti 800 or a Tata Nano but the others held the view that the high initial cost will be offset by the low running cost of the Reva. With both sides not relenting, we thought of doing an analysis of the cost of owning a Maruti 800 and Reva. In this blog we share what we found out, hope it will be useful to you as well. We have tried to calculate the cumulative cost of ownership which includes the cost (ex-showroom price) of the car, the total cost of fuel and the total maintenance cost for both Maruti 800 and Reva for a period of 84 months. We took a typical case of an office commute of 1200 Km per month. We have not considered the road tax, insurance cost or the interest paid if the car was bought on a loan. Also, we have not considered the resale value of the cars. We have considered the base price for petrol as Rs 67/- and then applied a 6% inflation on the petrol price. The inflation will that price of petrol to Rs 101/- in a period of 84 months, which I believe is conservative based on the way the petrol price is moving right now. The average mileage of Maruti 800 for a span of 7 years of city commute is taken as 15 Km/L and I believe, it is quite lenient towards it. The fuel expense of Reva (i.e cost of daily full charge) is set at Rs 600/- and 1% inflation on electricity price. The yearly maintenance cost of Reva is fixed at Rs 1000/- and that of the Maruti 800 is fixed at Rs 8000/-, these are figures picked up from various online automobile forums and people sharing personal experiences. We got the following graph when we plotted the monthly cost of owning each of these cars for a period of 84 months. What we learned is that Reva starts off with a higher cost of ownership owing to the higher price one has to pay for the car but the low operating cost enables the car to be on par with Maruti 800 within a span of 37 months. We assume that there need would be a battery change around 64 months time and that would spike the cost of ownership by 80,000. 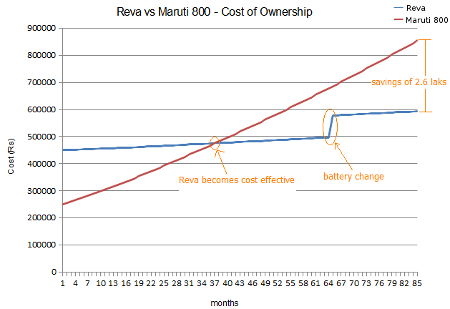 Even with the cost of battery change, Reva manages to be more economical than the Maruti 800. At the end of the period os 84 months, Reva would have resulted in a savings of Rs 2.6 lakhs. Clearly the results are in favor of Reva, buying a Reva is a very sensible decision. It saves you money and at the same time it is very green car as there is no emissions to pollute our environment. The cost of recharging the car batteries gets included in the monthly household electricity bill and this means one will not really "feel" the cost of using the car. A Reva owner can drive past the petrol pump with a smile on their face. Happy driving. PS: We will share the excel sheet used for this analysis on finahub facebook page, anyone interested in doing more analysis can download it for there.